With the new Wolverine movie "Logan" coming soon there has been a lot of attention on Wolverine. So, I decided to check out All-New Wolverine #16. For some, you are aware of the changes to the Wolverine characters but for those who don't know Logan is no longer Wolverine. Laura "X-23" is the all-new Wolverine. If you don't know who Laura is let me give you a brief summary. Laura was first introduced in X-men: Evolution animated television series. X-23 is the clone-daughter of Wolverine. X-23 was created to be the perfect killing machine and possesses all the powers of her father (although her entire skeleton isn't coated with adamantium only her claws). 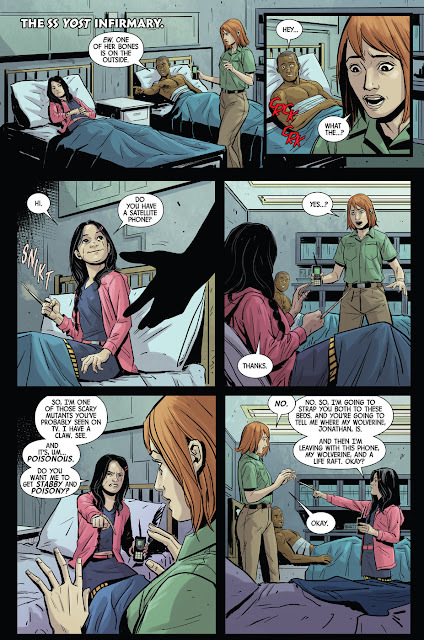 In the last issue of All-New Wolverine, X-23 was captured by Kimura. X-23 has refused to kill unless she absolutely has to. 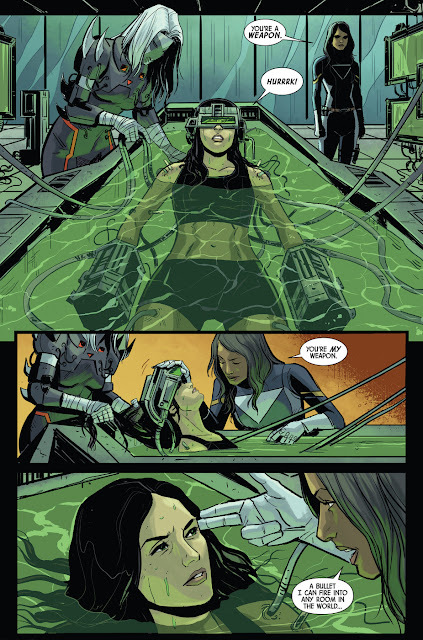 To revert X-23 back into her killing ways Kimura has placed her in a deprivation tank. This tank will cause X-23 to feel nothing but emptiness and pain. Kimura keeps her in the tank, and it causes X-23 to revert back into her feral state. Kimura wants X-23 to assassinate Tyger Tiger, a leader of Madripoor. Madripoor is the golden gateway between two worlds, where the free market and black market come together. After a week in the tank, X-23 is delivered to Tyger Tiger's office via crashing through a window from a helicopter. Meanwhile, Gabby (X-23's cloned sister) was working on her escape plan. When X-23 was captured, Gabby was also taken away. Gabby was on a ship with many other children to be used as slaves. Gabby eventually comes up with a plan to fake an illness to be moved out of the hold she's in to be moved into the infirmary. While in the infirmary, she threatens one of the doctors with her "poisonous" claws. Gabby and her wolverine "Johnathan" both get away and make their way to X-23. Gabby reaches X-23 just as she's in the process of killing Tyger Tiger. Gabby leaps on X-23's back and tries to subdue her out of her feral state. 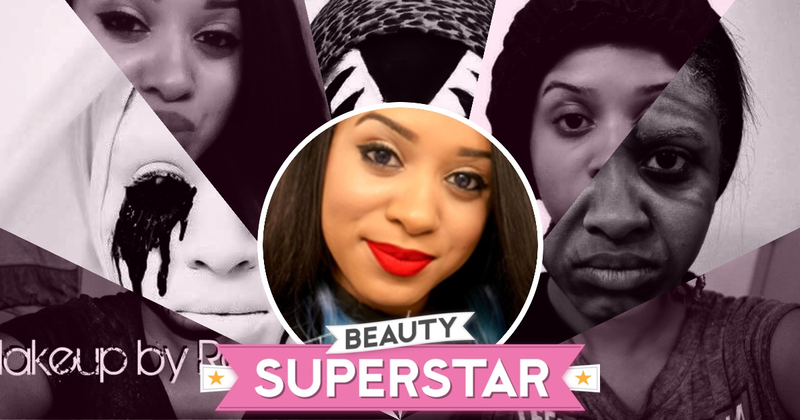 While the sisters are in a struggle with each other, they are met by a familiar face. Disclosure: All images are owned by Marvel and not of the author. I loved this issue of All-New Wolverine it has made me want to go back and read the entire series. 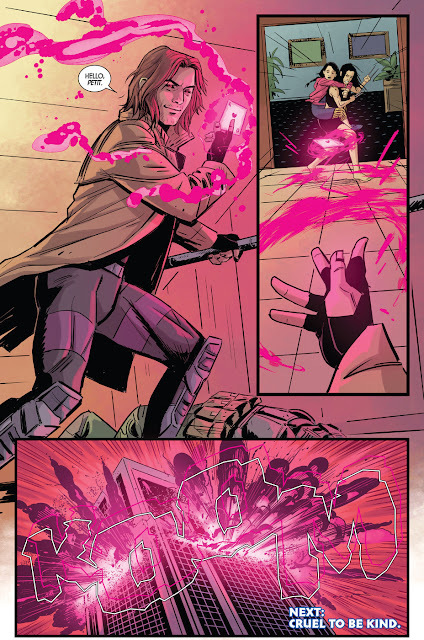 I'm really excited to read the rest of this I can't wait to see how X-23 does when she goes head to head with one of my favorite X-men Remy LeBeau "Gambit." 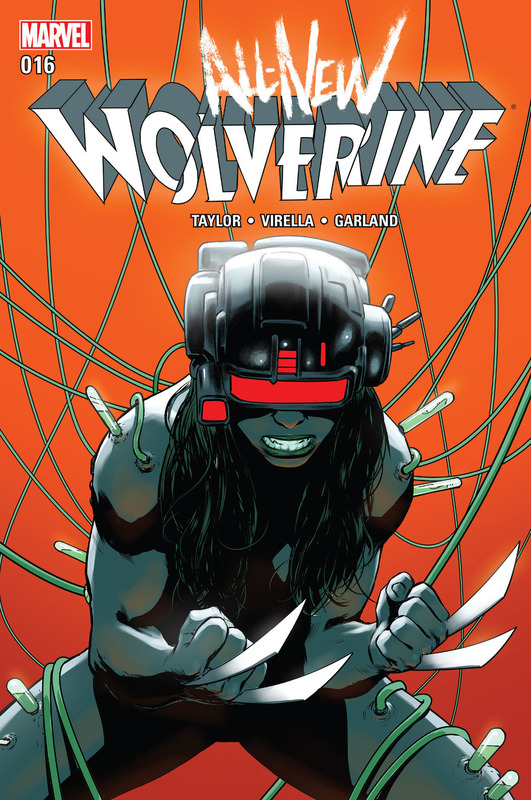 If you want to purchase All-New Wolverine #16 or any other Marvel Comic head over to Marvel.